In the room or rooms that you are heating find the best place to locate your manifold so it is close and easy to get to each room or rooms and mount your manifold to the wall. 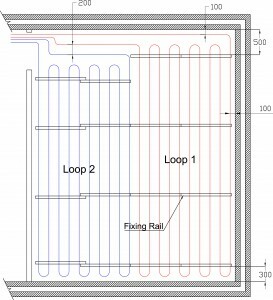 The manifold should be fixed so the underfloor heating pipe work can be easily connected into the bottom body of the manifold. Lay out the fixing rail on top of the floor insulation, depending on the length of the room there will usually be 3 or 4 runs of fixing rail. Once all the fixing rail is laid out fix it down with the insulation clips provided. Fix the fixing rail about 500mm away from the wall at the side of the room where the pipe work will enter. The other side of the room should be fixed about 300mm from the wall. 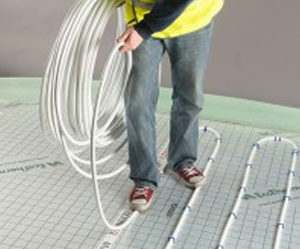 Next you need to connect one end of the Easy to use Alpert Underfloor Heating pipe to the top port of the manifold. Once this is connected you can then start to lay out the Underfloor Heating pipe into the fixing rails securing with insulation clips in the spaces inbetween the fixing rail and at the end of each pipe run until all your Underfloor Heating pipe is laid. (The recommended maximum loop should be no longer than 120m). Once you have all your pipe laid out and fixed down you need to return the end of your pipe back to the manifold and connect it into the bottom port of the manifold. 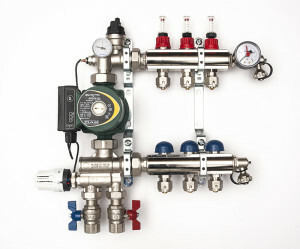 The system can be filed up and pressure tested using a hosepipe and the manifold mounted pressure gauge.